Okay, we've talked about Zombie movies. How about TV? I like The Walking Dead, the TV show. Before that, there was a comic book that I did not read, so I'm not the expert or anything. It confuses me a bit. Yesterday we talked about 28 Days Later, which mostly we think of as a zombie movie, but technically those are not zombies. Those people caught a disease that made them brainless homicidal maniacs, but they were never really dead. You can kill them. At the end of the film, they are starving to death, cause they've run out of victims to catch and they can't figure out how to use a can opener. They were certainly zombie-like, and you can say that a disease could be responsible for some of the zombie myth, but they were never dead so never really zombies. Unlike Night of the Living Dead, where dead people just decided to get up and attack people. Those zombies were dead. You could "kill" them with a bullet to the head, but they were already dead. They seemed to be trying to give it a science fiction explanation, but I'm thinking that unless aliens showed up later, that wasn't really going to work. These were dead people who were walking around. This is supernatural stuff, not science explained stuff. So this confuses me about The Walking Dead. 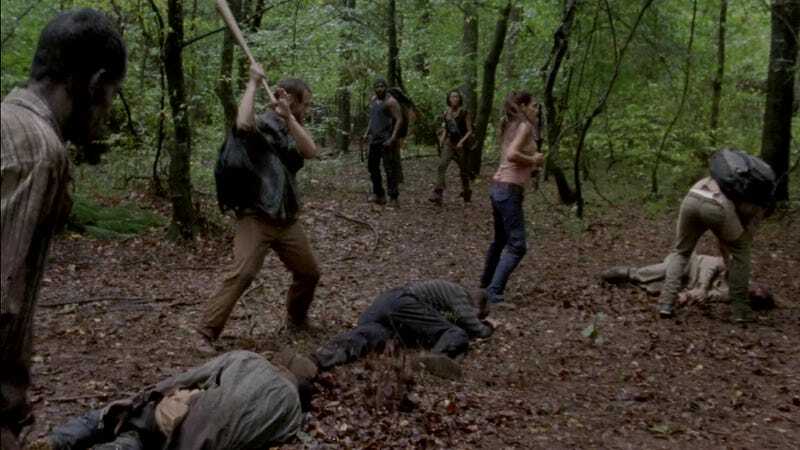 It seems to be that there was a disease, and that guy at the CDC showed us brain scans and stuff, told us that the part of the brain that makes us human dies and then this other part starts working again, and that's why the walkers can get up and walk again. See, this woman is dead. No matter what has been done to your brain, with this sort of injuries, you die. You bleed out, you can't eat anymore, etc...you die. So this woman is dead, but until her brain is physically destroyed with a blade or a bullet or just being smashed, she will keep moving around and trying to eat people. So that would make her a supernatural zombie, not a science fiction explanation of what people might have thought were zombies. So, there, I'm a bit confused. Don't really care that much, I still like the show, I'm just not sure where it belongs in the grand scheme of things. That is our main zombie TV here. We were going to get another show, where in one town a bunch of dead people just decided to get up and go home. They weren't trying to eat anybody or anything like that, they just wanted to go home. They remembered who they were and everything. Just, they were dead, some of them for several years, so is home still there? Some of them had spouses who had finally gotten over it and gotten involved with other people. Maybe their houses had been sold. They mostly had jobs, but other people had those now. Oh, and some of them didn't die from natural causes. Anyway, the pilot looked interesting to me, but they didn't make the rest of the series, so I'll never know what happened to them. Other countries have zombie TV. There's a British show (only saw like three episodes) where they had 28 Days Later type zombies, sort of, and then they developed a cure. Well, maybe not a cure, more like a treatment, cause you have to get shots everyday and you can't eat regular food and you're pale and your eyes look weird. But with treatment you don't act crazy and you remember who you are and all that. So the they are all sent home. Only not everyone wants them home. It was interesting. I think France also had a show like that, but I haven't seen it yet. Okay, any thoughts on any of that? And did I miss anything?